Colorado provides counsel to indigent youth through the Office of the Colorado State Public Defender. Attorneys with this statewide public defender system represent youth facing a delinquency petition for which incarceration is a possible penalty or whose liberty has been restrained by the government. Colo. Rev. Stat. Ann. § 21-1-103(2). In addition, the state public defender represents youth in post-disposition and appellate proceedings. Colo. Rev. Stat. Ann. § 21-1-104. Indigent defense is 100% state-funded. 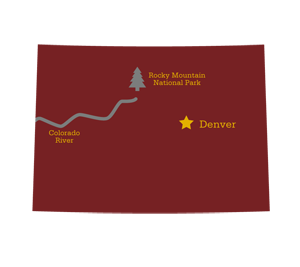 Colorado also has a statewide office of Alternate Defense Counsel that provides representation by contracting with attorneys and investigators in cases where the public defender has a conflict of interest. Colo. Rev. Stat. Ann. §§ 21-2-101, 21-2-103. A nine-member public defense commission advises the alternate defense counsel concerning the development and maintenance of competent and cost-effective representation. Colo. Rev. Stat. Ann. § 21-1-101. The Colorado Juvenile Justice and Delinquency Prevention Advisory Council passed a resolution in 2013 endorsing specialization in juvenile court practice. Under this resolution, the Advisory Council supports the establishment of standards of practice for juvenile defense. Colorado youth have a right to a trial by jury when the youth is alleged to be an aggravated juvenile defender or has committed an act that would constitute a crime of violence (as defined by Colo. Rev. Stat. Ann. § 18-1.3-406). Colo. Rev. Stat. Ann. § 19-2-107; Colo. R. Juv. P. 3.5. In these circumstances, the youth or the district attorney may demand a jury trial or the court may order a jury trial on its own motion. Id. In addition to statutes and case law, juvenile court proceedings are governed by court rules. These are often promulgated at the state level but may also be passed at the local court level instead of or in addition to statewide rules. Colorado’s juvenile court rules are called the Colorado Rules of Juvenile Procedure. Beyond the right to counsel in juvenile court guaranteed by the Due Process Clause of the United States Constitution and In re Gault, 387 U.S. 1 (1967), states often have state constitution or statutory provisions further expanding upon on or delineating that right. In Colorado, the State Public Defender, or in the case of a conflict, the Office of Alternate Defense Counsel, is authorized to represent youth in petitioned juvenile delinquency matters or when they “are in any way restrained by court order, process, or otherwise”, if deemed indigent or otherwise eligible for court-appointed representation. Colo. Rev. Stat. Ann. § 21-1-103(2); Colo. R. Juv. P. 3; see also Colo. R. Juv. P. 3.9(a)(2). “At the [youth]’s first appearance before the court, after the detention hearing or at the first appearance if the [youth] appears on a summons, the court shall advise the [youth] and his or her parents, guardian, or other legal custodian of the [youth]’s constitutional rights and legal rights . . . including, but not limited to, the right of counsel.” Colo. Rev. Stat. Ann. § 19-2-706(1); Colo. Rev. Stat. Ann. § 19-2-518(4)(a). The court must appoint counsel if the youth and their parent, guardian, or custodian is found to be indigent; if the parent refuses to retain legal counsel; if the court determines that “counsel is necessary to protect the interests of the [youth] or other parties[;] or the [youth] is in the custody of the state,” unless the youth has expressly waived his or her right to counsel. Colo. Rev. Stat. Ann. § 19-2-706(2)(a). The appointment of counsel continues until: “the court’s jurisdiction is terminated; the [youth] or the [youth]’s parent, guardian, or legal custodian retains counsel for the [youth]; the court finds that the [youth] or his or her parents, guardian, or other legal custodian has sufficient financial means to retain counsel or that the [youth]’s parents, guardian, or other legal custodian no longer refuses to retain counsel for the [youth]; or the court finds the [youth] has made a knowing, intelligent, and voluntary waiver of his or her right to counsel.” Colo. Rev. Stat. Ann. § 19-2-706(2)(d). Colorado has no presumption of indigence in juvenile court proceedings. The defendant’s parent or legal guardian requests a public defender by submitting an application, and a determination of indigency is made by the state public defender, subject to review by the court. Colo. Rev. Stat. Ann. § 21-1-103(3). A copy of the application is also sent to the prosecuting attorney, and they can request for the court to hold a determination of indigency hearing. Id. Youth may still receive representation from a public defender in detention hearings before a determination of indigency is made. Colo. Rev. Stat. Ann. § 21-1-103(5). If a public defender appears on behalf of the defendant, then the applicant must pay a $25 processing fee upon final disposition, unless the fee is waived by the court based on the financial information submitted. Colo. Rev. Stat. Ann. § 21-1-103(3). “An indigent person is one whose financial circumstances prevent the person from having equal access to the legal process.” Chief Justice Directive 04-04 (July 2018). A person is indigent if their income is no more than 75% above the income eligibility guidelines. Id. If the youth’s nonindigent parents or legal custodian refuse to retain counsel, then the court will order the parents or legal custodian to reimburse the court for the public defender’s representation, unless the court waives the reimbursement requirement. Colo. Rev. Stat. Ann. § 19-2-706(2)(b)(I). understands the possible consequences that may result from an adjudication, including collateral consequences. Colo. Rev. Stat. Ann. § 19-2-706(2)(c). When and how the court may decide to detain a youth or otherwise place restrictions on the youth’s freedom is defined by statute and court rules. In Colorado, a detention hearing must occur within 48 hours of detention, excluding weekends and legal holidays. Colo. Rev. Stat. Ann. § 19-2-508(3)(a)(I). If the youth is held in detention following the detention hearing, “the district attorney shall file a petition alleging the juvenile to be a delinquent within  hours after the detention hearing, excluding Saturdays, Sundays, and legal holidays.” Colo. Rev. Stat. Ann. § 19-2-508(3)(a)(V). Provisions for the detention of juveniles are found in Colo. Rev. Stat. Ann. §§ 19-2-502, 19-2-507, 19-2-508, 19-2-509, and 19-2-911, and in Colo. R. Juv. P. 3.1, 3.7, and 3.8. The U.S. Constitution and Supreme Court case law are also sources of due process rights beyond local and state statutes and provisions. NJDC’s Detention Page provides more information about detaining youth. The legal needs of youth in the delinquency system rarely end at disposition, and states vary in the way they provide a right to representation on these post-disposition issues. “Any hearing before the board or a hearing panel to grant, modify or revoke parole.” Colo. Rev. Stat. Ann. § 19-2-1002(8). Violation of probation hearings, Colo. Rev. Stat. Ann. § 19-2-925(4)(b). NJDC’s Post-Disposition Page has more information on this topic from a national perspective. The juvenile court can retain jurisdiction over a youth until “all orders have been fully complied with by such person, or any pending cases have been completed, or the statute of limitations applicable to any offense that may be charged has run, regardless of whether such person has attained the age of eighteen years, and regardless of the age of such person.” – Colo. Rev. Stat. Ann. § 19-2-104(6). Fourteen or older and has allegedly committed a delinquent act that constitute a felony. Colo. Rev. Stat. Ann. § 19-2-518(1)(a)(I). The juvenile court must conduct a transfer hearing, and the court shall consider whether there is probable cause, the interests of the youth and the community, age of the defendant, and any previous delinquency history. Colo. Rev. Stat. Ann. § 19-2-518(3). The court shall make certain that the youth and their parents, guardian, or legal custodian have been fully informed of their right to be represented by counsel. Colo. Rev. Stat. Ann. § 19-2-518(4). Once an Adult, Always an Adult: Has previously had a case transferred or directly filed in adult court – with a couple of exceptions. Colo. Rev. Stat. Ann. § 19-2-517(1)(a). A direct filing is not mandatory, so the youth may file a motion to be transferred to juvenile court. Then the district court must conduct a reverse-transfer hearing and consider the youth’s age, maturity level, prior record, mental health status, and likelihood for rehabilitation. Colo. Rev. Stat. Ann. § 19-2-517(3). NJDC conducts statewide assessments of access to counsel and the quality of juvenile defense representation in delinquency proceedings around the country. These assessments provide a state with baseline information about the nature and efficacy of its juvenile indigent defense structures, highlight the strengths and weaknesses of the indigent juvenile defense system, and provide tailored recommendations that address each state’s distinctive characteristics to help decision-makers focus on key trouble spots and highlight best practices. The NJDC State Assessment Page provides more information about state assessments. The Colorado Assessment was completed in 2012.